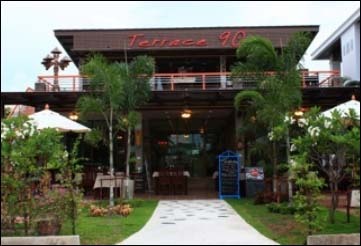 The Terrace 90 is a Bakery/Coffee Shop and Deli with Restaurant. Nestled on Soi 90 with access from either Petchkasem Road or Soi 94. (See Map). We have purpose built this new building and the theme is a modern Thai/European.The concept is a relaxed garden setting with an air-conditioned restaurant, bakery/coffee shop. UBC TV, wifi and two terraces. The Terrace 90 also offers off street parking. Relaxed Garden setting with an Air-conditioned Bakery/Coffee Shop and Restaurant.